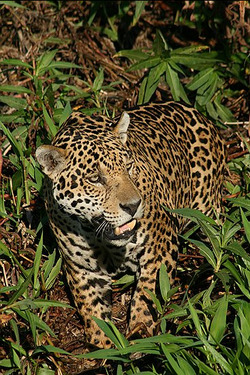 “What a surprise……who would have expected WILD Jaguars…..we just returned from our inaugural trip to the Pantanal in Brazil and we were all blown away by the incredible, visible wildlife! Designed by Patricia Medici, a local biologist and Chair of the IUCN Tapir Specialist Group, this tour truly has the feel of an African Safari, as you participate in Game drives, horseback rides and boat tours, the wildlife just keeps surprising you. Our July 2010 trip has already SOLD-OUT. But, because this trip is proving so popular we have already added another departure in August 2010 and this too is filling fast. If you have always dreamed of seing a Jaguar in-the-wild then you should sign up quickly, as spaces are limited! This Pantanal tour in Brazil was designed with expert local help from Patricia Medici, a local biologist and Chair of the IUCN Tapir Specialist Group. This tour truly has the feel of an African Safari, as you participate in Game drives, horseback rides and boat tours, indeed around every corner the wildlife just keeps surprising you. We can promise that you will see Coatimundis, Capybara, Caimans, stunning Hyacinth Macaws, Jabiru Storks galore, parrots, toucans, Ibis of many different species, Rheas and so much more. We also discovered a remote camp where we are confident you will see WILD Jaguar! For more information call Ged at 877-463-9756 or visit www.ecotours.com. *BTW, don’t be surprised, as I was last time I called, if Ged answers the phone himself from a satellite phone deep in the heart of one of our planet’s most remote jungles. Listen on-demand to my radio interview with Ged Travel That Makes A Difference as we discuss favorite travel memories, sustainable tourism, new itineraries for 2010 and much more.